To learn English fast you need to optimize your mind for specific skills. My teaching method is designed to improve your concentration skills, increase you auditory memory and motivate you to focus not just to the content of your learning but also to the development of your brain for faster processing. Motivation and your attitude are the key elements in learning effectively. But it is not enough just motivate yourself for the end goal. You need to teach your mind to enjoy the learning process, too. Without result oriented approach and enjoying the learning itself, you will give up your study quickly. You also need to optimise your mind for persistence and dealing with distractions. You need to learn to adopt and follow effective learning processes and make them your habits. 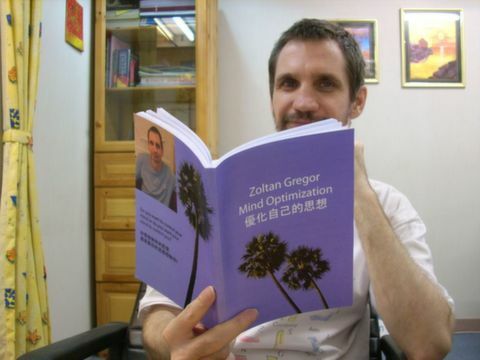 Studying and applying the mind optimization method, which I described in my book "Mind Optimization" and teach in my courses can help you better understand how the mind works, and what we need to improve. You learn new things (new words or a new meaning of a word, or grammar). You use previously learnt things and accelerate your speed (speaking, listening). If you want to improve your oral language skills, speaking and listening, you need to do exercises that cover all the three areas above. It means you'd better develop all the required skills to learn more and more effectively. Learning new language elements and correcting the wrong ones, especially for oral and auditory learning, you need to focus and memorise the sounds of words and grammar rules. Most people in this short attention-span age have no effective concentration and mental skill. Simple conversation helps you access your learnt knowledge faster but it does not help you learn new material or improve your pronunciation or grammar. If you have a cost-reducing, effort-reducing attitude to learning, you probably just want to chat to improve your English. It is about saving energy, doing the easy thing. If you have a benefit-maximising attitude (learning faster and correctly) you need to invest mental energy into the learning process. It requires focus and memorisation, things that we do not naturally like or want to do..
Once specific method I use in English teaching is learning by ear only. Since most Hong Kong people learn English visually, by reading, their auditory processing skills and auditory memory is not very good. The method itself has the built-in function to increase the brain's short and long term memory, especially the auditory memory capacity and the skill to focus intensively for all the details. For example, you watch a 10-second video scene many times and you have to memorise it word by word. It forces you to pay attention and it will improve your memory, too. When your brain starts to adapt to the new challenge, your listening skill will significantly improve. Another mental tool - but just for higher level students - is the discussion topics themselves. The interesting topic about communication, leadership, health, marketing, creativity, spirituality, personality, teaching and learning will you see connections, gives you frameworks and structures for thinking and helps you to develop your abstract thinking skills.